The experienced full-back may be club captain at Old Trafford, but he has been nudged down the pecking order following a spell on the sidelines. Antonio Valencia says his absence from the United side is a "tactical decision". 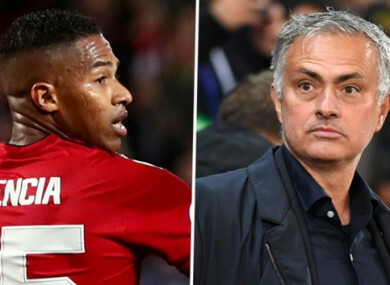 ANTONIO VALENCIA CLAIMS a “tactical decision” is keeping him out of the Manchester United side, with his absence under Jose Mourinho not down to any fitness issues. The 33-year-old defender is club captain at Old Trafford, but has taken in an eventful 2018-19 campaign. He started the season nursing a knock and found himself back on the sidelines in early October. A slip out of the starting XI coincided with Valencia liking an Instagram post calling for Mourinho to be sacked by the United board. The Ecuadorian apologised for his actions, which he put down to a simple mistake, and claimed to be “fully supportive” of his manager. Mourinho has, however, kept him out of action and Valencia has revealed after netting for his country in a clash with Peru that a lack of domestic football is down to being dropped. He told Area Deportiva: “Right now I haven’t been playing, but it’s more of a tactical decision. The player who has been in my place [Ashley Young] has been playing well. You have to respect the decision. “The only thing I can do is prepare and be ready for when he [Mourinho] needs me and be in the right condition to compete. I’m calm right now and I know I’ll get an opportunity to play again. Valencia was on target for his country in a 2-0 victory on Thursday and is preparing to head back to England with the intention of forcing his way back into contention at United. He will not be figuring for Ecuador against Panama, with a return to full-match sharpness set to be sought in Manchester. I told the coach that I can only play with Peru, with Panama the recovery time is smaller and I asked him to let me go to the club,” said Valencia. United will be back in Premier League action on November 24 when they welcome Crystal Palace to Old Trafford. They will take to the field in that contest sat eighth in the table, 12 points off leaders Manchester City and seven adrift of the top four. Email “Valencia claims to have been dropped by Mourinho, not rested”. Feedback on “Valencia claims to have been dropped by Mourinho, not rested”.